This French Onion Soup has incredible depth of flavor and is so easy to make. Plus, it’s made even easier and richer by slow cooking it in the crockpot. I’ve been making French Onion Soup for years. There’s just something about it that’s totally soul satisfying with it’s caramelized onions and the gooey cheese and bread on the top. And the thing is, it’s so easy to make. 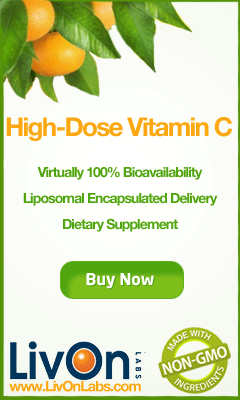 Really…there’s only about 7 ingredients. 6, if you don’t add the wine. And even without the wine, the flavor is still very good. I know there are other recipes out there where this soup is finished in 15 minutes, but really French Onion Soup is best when it simmers a long time. The flavors just come together better. In the past, I would always use Beef Consommé as the base. But the sodium always has been a concern. I would usually use two 10 oz. 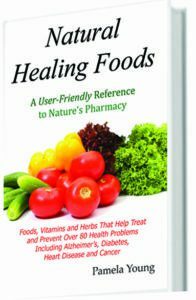 soup cans and that total sodium came in at a whopping 3750 mg! Not good on anybody’s diet. So to lighten it up this time I used Beef Bone Broth as a substitute. I have to tell you, I’m a new convert! The flavor was great. Better than great! I was concerned that it wouldn’t be as good because it’s not as viscous. But you really don’t miss gelatin in the consommé. Plus the sodium only came in at 928 for 31 oz. 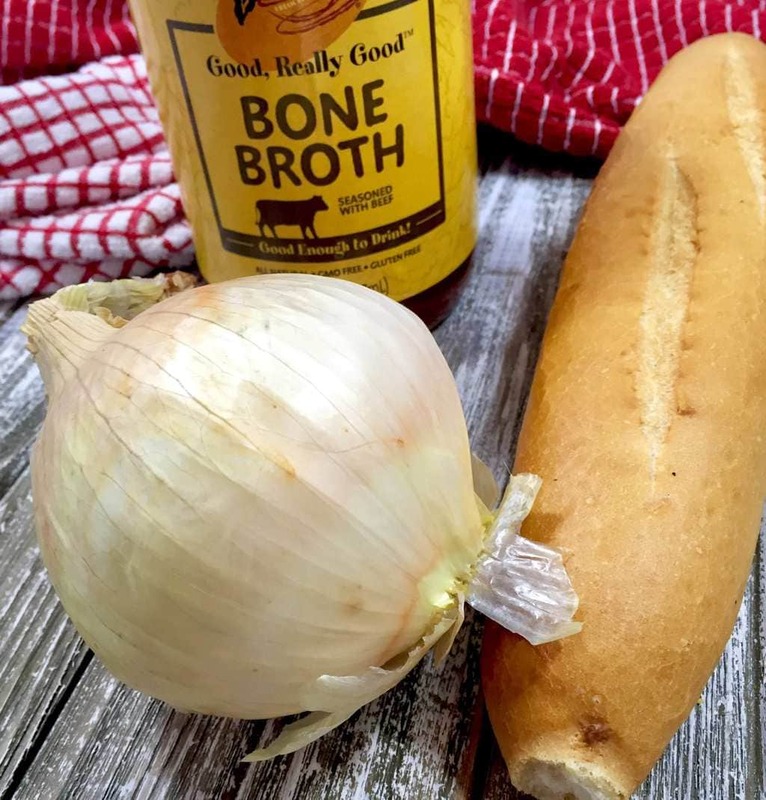 And the health benefits of bone broth are huge. Check out this article from Shape magazine. 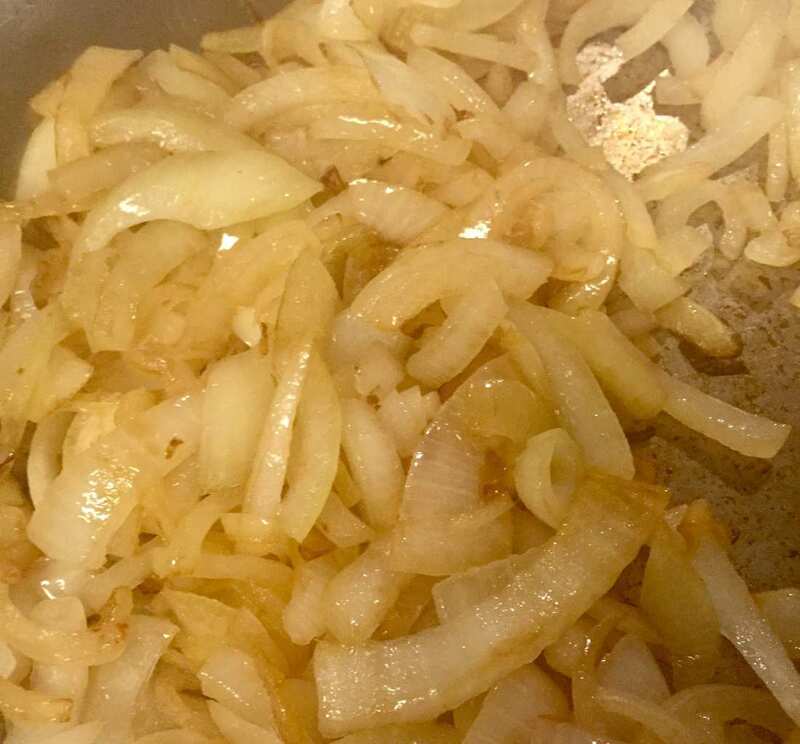 In a large frypan over medium heat, add the butter and when it begins to bubble and foam add in the thinly sliced onions. Some people like their onions finely chopped, but in this soup I like them in rings or to make it easier to eat, rings cut in half. Sauté the onions for 3-4 minutes. Just enough until they begin to caramelize. Add the onions and any juices to a crockpot. Then add the beef bone broth and the wine. Set the heat on low and let it simmer 6-7 hours. When you’re ready to serve, ladle the onions and broth into serving bowls. Slice the baguette and top each bowl with two slices. Then top with Swiss cheese. Finally, ladle additional hot broth over the bread to melt the cheese. 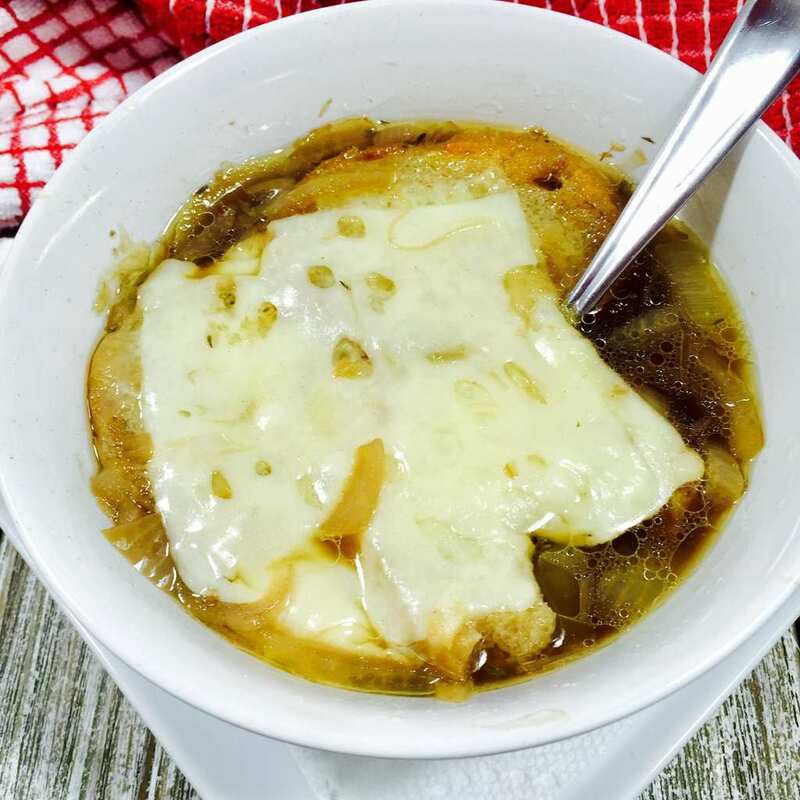 This French Onion Soup is has incredible depth of flavor and is so easy to make. Plus it's made even easier and richer by slow cooking it in the crockpot. Add butter to frypan over medium heat. Add onions and cook until onion begins to caramelize, about 3 minutes. 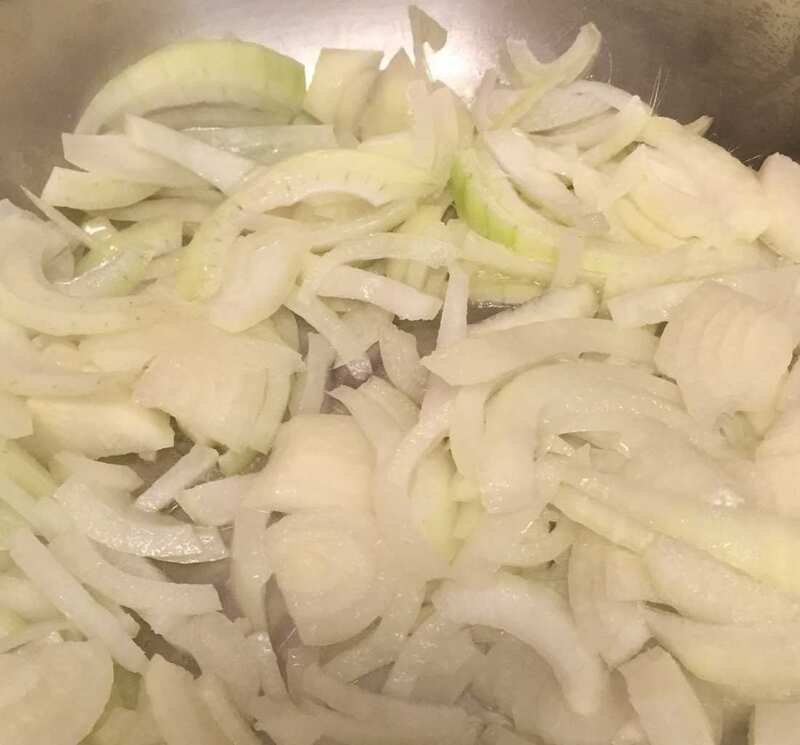 Add carmelized onions to slow cooker. Then add Bone broth, red wine and thyme. Cook on low for 6-7 hours. When read to serve, ladle soup in a serving bowl. Top with Baguette slice and Swiss cheese. Then ladle extra hot broth over top to melt the cheese.